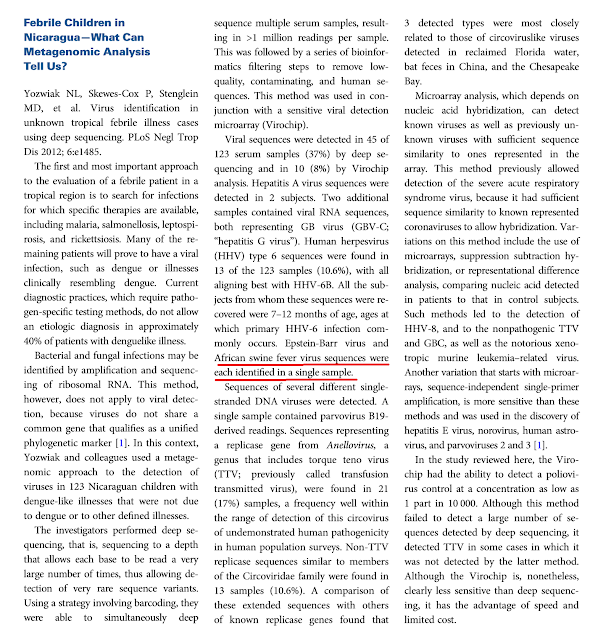 HHV-6 University : Is China also hiding human infections with African Swine Fever? Is China also hiding human infections with African Swine Fever? African Swine Fever is a big story already because, when and if it spreads to all of Western Europe and all of Asia, it will cause the collapse of a major portion of the agricultural export economies of the affected countries. We're talking about many billions of dollars of losses. And the problem is not temporary because those countries will be suspected of harboring the disease in their wild boar and ticks for decades to come. The disease could easily become endemic. But the issue is so much more important because of the disturbing body of evidence that shows that African Swine Fever Virus can infect humans (despite what authorities currently insist). Thus far, Europe's leading publications and journalists have failed to warn the public of the impending ASFV risk to their health. Here are the biggest African Swine Fever stories they have missed. 1. The African Swine Fever Vaccine for humans. 2. Evidence of African Swine Fever found in people with fevers. Dengue virus is an emerging infectious agent that infects an estimated 50–100 million people annually worldwide, yet current diagnostic practices cannot detect an etiologic pathogen in ∼40% of dengue-like illnesses. Metagenomic approaches to pathogen detection, such as viral microarrays and deep sequencing, are promising tools to address emerging and non-diagnosable disease challenges. 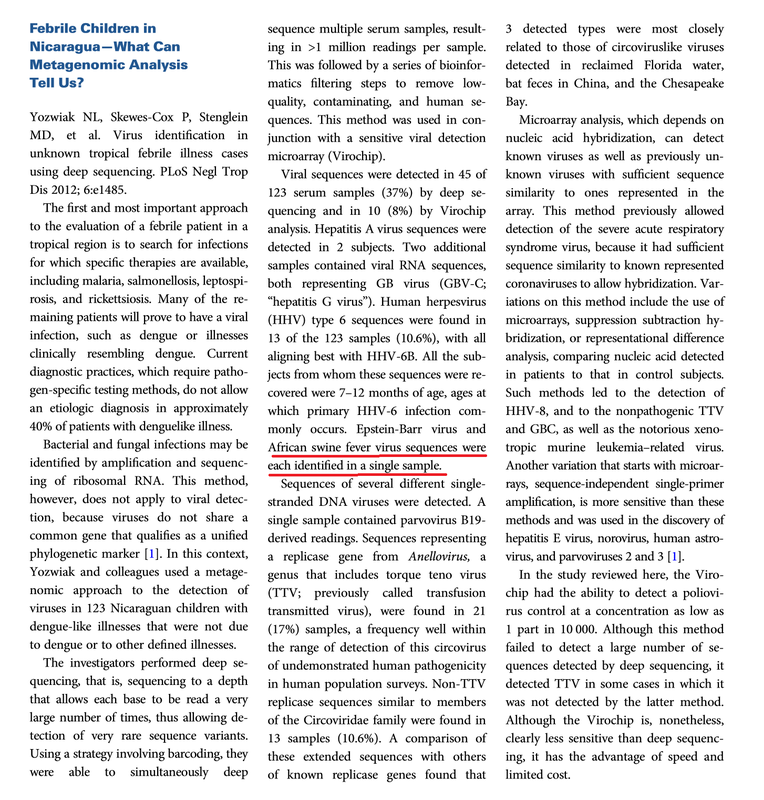 In this study, we used the Virochip microarray and deep sequencing to characterize the spectrum of viruses present in human sera from 123 Nicaraguan patients presenting with dengue-like symptoms but testing negative for dengue virus. We utilized a barcoding strategy to simultaneously deep sequence multiple serum specimens, generating on average over 1 million reads per sample. We then implemented a stepwise bioinformatic filtering pipeline to remove the majority of human and low-quality sequences to improve the speed and accuracy of subsequent unbiased database searches. By deep sequencing, we were able to detect virus sequence in 37% (45/123) of previously negative cases. These included 13 cases with Human Herpesvirus 6 sequences. Other samples contained sequences with similarity to sequences from viruses in the Herpesviridae, Flaviviridae, Circoviridae, Anelloviridae, Asfarviridae, and Parvoviridae families. In some cases, the putative viral sequences were virtually identical to known viruses, and in others they diverged, suggesting that they may derive from novel viruses. These results demonstrate the utility of unbiased metagenomic approaches in the detection of known and divergent viruses in the study of tropical febrile illness. 3. A Russian Scientist warns that African Swine Fever could infect humans. "The African swine fever (ASF) virus, may in the future become dangerous for humans, according to the head of the Russian Epidemiology Service, Chief State Sanitary Doctor Gennady Onishchenko, at the press-conference in St. Petersburg. According to him almost all viruses from time to time go through mutation processes which can give them some additional functions." 4. Detection of Novel Sequences Related to African Swine Fever Virus in Human Serum and Sewage. Loh J, Zhao G, Presti RM, Holtz LR, Finkbeiner SR, Droit L, Villasana Z, Todd C, Pipas JM, Calgua B, Girones R, Wang D, Virgin HW. Departments of Pathology & Immunology and Molecular Microbiology, Department of Medicine and Department of Pediatrics, Washington University School of Medicine, St. Louis, Missouri; Department of Biological Sciences, University of Pittsburgh, Pittsburgh, Pennsylvania; Department of Microbiology, Faculty of Biology, University of Barcelona, Barcelona, Spain. "The family Asfarviridae contains only a single virus species, African swine fever virus (ASFV). ASFV is a viral agent with significant economic impact due to its devastating effects on populations of domesticated pigs during outbreaks, but has not been reported to infect humans. We report here the discovery of novel viral sequences in human serum and sewage which are clearly related to the Asfarvirus family, but highly divergent from ASFV. Detection of these sequences suggests that greater genetic diversity may exist among Asfarviruses than previously thought, and raises the possibility that human infection by Asfarviruses may occur." 5. How the American science Robert Gallo may have stolen the African Swine Fever research of a Boston University scientist and may have given African swine Fever the fraudulent new name of "HHV-6." "In August, 1986, John Beldekas was invited to go to the NCI and present his findings on the link between ASFV [African Swine Fever virus] and AIDS, which he did. Beldekas gave samples of all his lab work to Gallo. Later, the government asked Beldekas to turn over all his reagents and lab work to the government, which he did. Beldekas had found ASFV presence in nine of 21 AIDS patients using two standard procedures. At the meeting, Gallo was reported saying: “we know it is not ASFV.” How could Gallo know this as he hadn’t done any of his own tests to look for ASFV? Two months later, Gallo published an article in Science (Oct 31, 1986) that he discovered a new possible co-factor in AIDS, a virus he called Human B Cell Lymphotropic Virus which he named HBLV. Like ASFV, HBLV infected B cells and also lived in macrophages. Did Gallo steal Beldekas’s ASF virus he found in AIDS patients and rename it HBLV? Later on, when Gallo found that HBLV could also infect other immune cells, he changed the name of HBLV to HHV-6. Eventually, Gallo identified his HBLV as the variant A strain of HHV-6 and called it a human herpesvirus." 6. The epidemiology that suggests that African Swine Fever in people in Sardinia is misidentified as HHV-8. A comparison of the K.S. lesions in humans and ASFV lesions in pigs might be in order.Given that African Swine Fever is currently spreading in Russia and is now threatening Europe and China, (Reference) it would be useful to know whether people who are exposed to pigs with ASFV are at increased risk for HHV-8, Kaposi's sarcoma and the other pathologies associated with HHV-8. A study in sub-Saharan Africa where ASFV is endemic and HHV-8 is also endemic (Reference) might be useful. And areas of Russia where ASFV is spreading could be monitored closely for any signs of an increase of K.S. or HHV-8 infection and HHV-8 related pathologies.HHV-8 is an emerging health problem. HHV-8-associated K.S. is a significant problem in AIDS patients. It may also be the key to Chronic Fatigue Syndrome. HHV-8 has been found in the cerebrospinal fluid of 50% of Chronic Fatigue Syndrome patients. (Reference) HHV-8 has been linked to type 2 diabetes. (Reference) HHV-8 has been detected in B-cells in Castleman's disease and primary effusion lymphoma. (Reference). If HHV-8 is a form of ASFV, it is possible that pigs might constitute a useful animal model for the study of possible treatments for K.S. and other pathologies associated with HHV-8. And if there is any relationship between ASFV and HHV-8, people may have to be warned to take special precautions around pigs in areas where there are ASFV outbreaks. And countries where undercooked pork is consumed (like Ukraine where salo is a staple) may need to alert the public to cook all pork products thoroughly during ASFV epidemics. 7. ASF virus, adapted to grow in VERO cells, produces a strong cytopathic effect in human macrophages leading to cell destruction. 8. A sick child tests positive for African Swine Fever virus. 9. 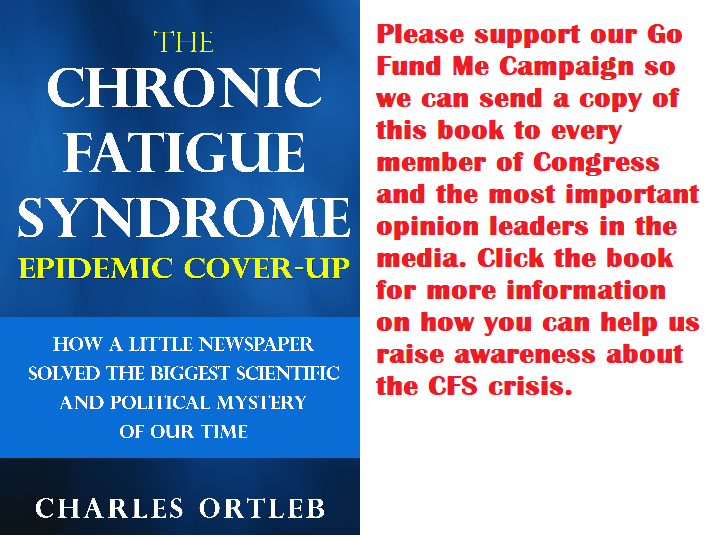 Newspaper publisher writes The Chronic Fatigue Syndrome Epidemic Cover-up, a memoir about uncovering the African Swine Fever cover-up in America. The Chronic Fatigue Syndrome Epidemic Cover-up details the investigative reporting of a New York Native that reveals the Centers for Disease Control and the United States Department of Agriculture lied about the presence of African Swine Fever in pigs and people. 10. Journalist pens The African Swine Fever Novel, an Orwellian novel warning about the consequences of an African Swine Fever Virus epidemic in humans.